The third nominee for this year’s Spiel des Jahres is Qwirkle. This was a surprise nomination because the game is five years old (originally came out in 2006). However, like last year’s Identik (previously published as Portrayal), it represents a German reprint of an older game from a small independent company. In this case, that company is MindWare. MindWare generally produces educational toys and games. It was designed by Susan McKinley Ross, and if it wins, she will be the first female designer to win the SDJ in a solo capacity. As far as I can tell, only three females have won the SDJ, though they were both co-designers – Dorothy Garrels with five others for Scotland Yard in 1983, Suzanne Goldberg with two others for Sherlock Holmes Consulting Detective in 1985, and Karen Seyfarth with her husband Andreas for Thurn and Taxis in 2006. 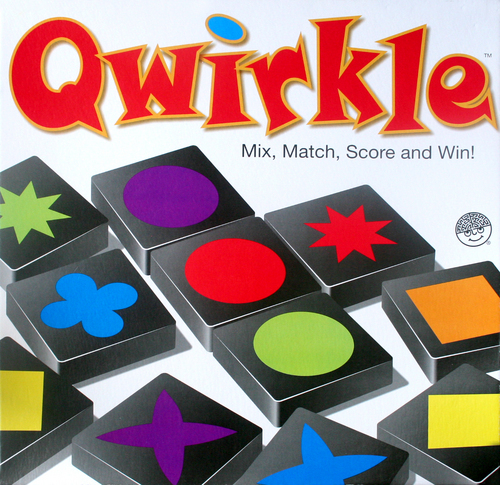 But back to Qwirkle (now eligible for the SDJ due to its release by Schmidt Spiele). The game is for 2-4 players aged 6 and up, and takes around 45 minutes to play. It’s an abstract game that’s all about matching colors and shapes. Included are 108 tiles and a bag. There are six different shapes and six colors, and there are three tiles for each combination. Each player starts by drawing six tiles from the bag. Declare the number of tiles that you have that share ONE attribute (color or shape), not counting duplicates. The player with the most goes first, playing those tiles immediately – the oldest player wins a tie. You have three choices on your turn: play one tile, play multiple tiles, or trade for new tiles. If you add tiles, you’ll place them adjacent to tiles already in play. You’ll be creating lines of one shape, or lines of one color. If you’re adding on to an existing line, just know that each line of the same color can only have one of each of the six shapes, and a line of the same shapes can only have one of each of the six colors. Whatever the case, you’ll score after each placement – one point per tile in the line (even tiles that were already there). If you place a tile that is part of two different lines, it scores two points. 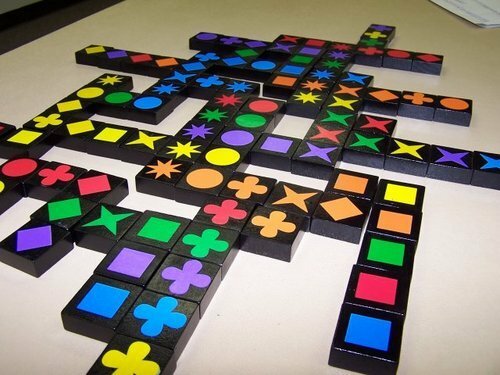 If you complete a line of six tiles, you score six bonus points for a Qwirkle (12 total). You draw back up to six tiles afterwards. To trade tiles, simply set aside the ones you don’t want, draw new ones, and put the ones you didn’t want back in the bag. This is required if you can’t play, but it’s also optional if you just don’t want to. The game continues until the bag is empty and one player has used all of their tiles. They get six bonus points for ending the game. The player with the most points wins. This game is one that I have not played, but it looks extremely simple to pick up, though with probably a lot more strategy than would be expected. The most obvious comparison is to Scrabble in the way that you’re almost making a crossword with your tiles, but much easier since you’re not using letters. It seems like a nice portable game, especially since you don’t have a board. There’s no theme, but that’s OK – it’s an abstract. I think kids would really get into it, and might be able to compete consistently with adults – just play as many tiles as you can at once for lots of points. It’s one that I’ve wanted for a while, so I’m glad to see it among the SDJ nominees. It’s by far the simplest of the three – but I’ll talk more about that in the predictions. Next time, it’s on to the Kennerspiel des Jahres nominations. Thanks for reading! Qwirkle is really light. It’s quite a bit fun and is totally accessible by pretty much anyone, but it’s also very luck-based (on getting the tiles you need to complete “Qwirkles”, which means placing the sixth tile in a row or column and is worth bonus points) and tends to go on a little longer than I’d like. I’m really hoping that the SdJ goes to Forbidden Island, both because I like it a lot better and because I think it would be cool to recognize a cooperative game for the first time. I think I would like Qwirkle, but I see what you’re saying about luck and length. I would imagine that the AP problem would only get worse as the game goes on as you’re trying to find the optimal move for your tiles. It’s not really an AP problem. Most of the time, it’s pretty obvious where you should place your tiles. The length issue is more about how the game sort of limps its way to the end, where someone has to find a way to get rid of all their tiles, often in sub-optimal ways that take forever to work out. While I could see some manipulation of the board early on to set yourself up to make Qwirkles, at the end a big score is most likely going to come from just randomly drawing a tile that finishes something on the board.